Natural infrared rays are the safest energy source. Perfect balance between amethyst, tourmaline, and ochre. Originally developed for NASA, the space age memory foam conforms to the head and neck to ensure an anatomically supportive sleep posture. 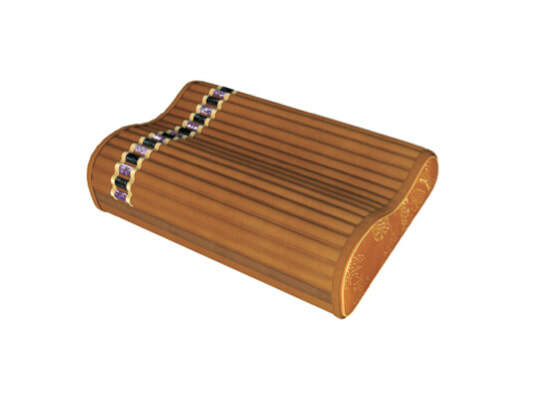 It also features a therapeutic shape to provide additional support for the neck while comfortably cradling the head. As an added touch, a luxurious zippered cover featuring alternating rows of amethyst and tourmaline lines the memory foam aiding in a restful sleep. 3D surface removal production technology prevents the product from yellowing. The combination of ochre and negative ions works for antimicrobial action and the removal of unfavorable odors. The pillow's ergonomic design reflects the best possible sleep science. The Richway BioMat Pillow can be used as an accessory to the BioMat. The pillow is composed of two parts. The outer sheath contains alternating rows of amethyst and tourmaline crystals. The inner part is a memory foam insert, giving the pillow shape. 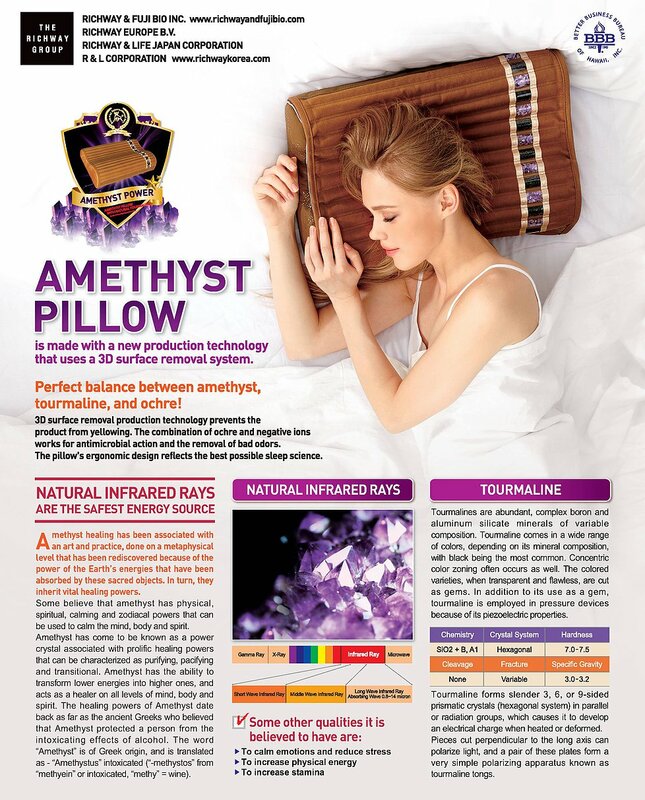 The Richway Pillow does not produce infrared therapy or negative ion therapy. Nevertheless, it is a versatile useful healing tool. The shape is designed to produce mild neck traction which can be beneficial as a thirty or forty minute treatment. After detaching the outer sheath cover, it may be laid flat. This crystal sheath can be heated on the BioMat for about twenty minutes. It will then produce far infrared light, just as the BioMat. The sheath can be wrapped around an arm or leg for a local treatment - or lay the crystal sheath over you for a “sandwich treatment.” The memory foam insert can still be used during your treatment, or otherwise if desired. The BioMat Pillow is optional. It does however provide a place to lay the head with elevation and allow it to be cool during treatment - and have the benefit of amethyst and tourmaline crystals during treatment. The full-body sized BioMats have nine inches at the top, which have no crystals and produce no heat. For your comfort, a pillow of your choosing can be using in place of the BioMat Pillow. Taking facts into consideration, the BioMat Pillow is recommended for professional use and home use. It is part of the overall treatment plan developed by Richway - and does add to the comfort, and experience.